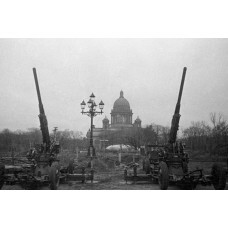 The Siege of Leningrad was a prolonged military operation by the German Army Group North and the Finnish Defence Forces to capture Leningrad in the Eastern Front theatre during the World War 2. It started on 8 September 1941, when the last land connection to the city was severed. Although the Soviets managed to open a narrow land corridor to the city on 18 January 1943, the total blockade liftoff took place on 27 January 1944, 872 days after it began. It was one of the longest and most destructive sieges in history and one of the most costly in terms of casualties. It is a truly dark and mournful page in city's history. Museum of Leningrad Blockade in the Rumyantsev Mansion.